I’ve been quite aware of The Flash–particularly Wally–since my initial foray into comics back in 1989/1990…my earliest conscious exposure to the character offhand was Adventures of Superman #463. Mr. Mxyzptlk forced the two to race…and this stands out to me because of the fact of Wally constantly eating, the notion that even with the super-speed, he was still burning calories and all that (to my 8/9 year old self, the simple “have to eat to keep going” was enough). I became more aware of the character with guest-appearances here and there, and the “key” role he played at the start of Zero Hour, and as I learned more about “continuity” and such, I became aware of Barry and generally got to where the Flash was an accepted character for me. I didn’t start picking up any issues of his actual series on any regular basis, though, until #197 (Geoff Johns, first issue of the Blitz arc) in 2003 or so, and I’ve moved forward from there. 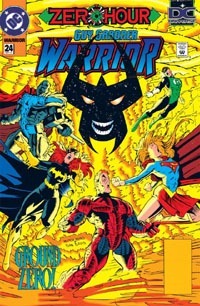 I’ve become aware of several creative teams, and it was all the positive “buzz” for Mark Waid‘s run and then the (at the time) up and coming Geoff Johns that eventually led to me trying the series. But outside of maybe a couple issues, I really have never actually gotten (around) to reading Wally’s series, particularly from this period. So jumping into #1 here rather arbitrarily was definitely an interesting experience. We open on Wally–now 20–at a convenience store and come to find out he’s marking time before a “surprise” party for his 20th birthday. He’s no longer a teenager (and now being The Flash and not Kid Flash, no longer a “teen” Titan). He’s “graduated” into the role, stepping into the costume previously worn by Barry Allen, and he’s got huge boots to fill. Before the party can really get rolling, Wally receives a phone call: a heart is available for a transplant…in Seattle. And conventional technology cannot get it there in time, so it’s up to Wally to race the heart to the opposite coast. He extracts some conditions, pointing out that he’s doing a favor, and these doctors are getting paid huge sums, but he (Wally) could use medical insurance (wow…30 years ago!) and such…that it’s the principle of the matter. (To say nothing of the fact that he needs the calories for such an extensive trip). Along the way Wally encounters someone who was apparently attacked by Vandal Savage, and witnesses other situations he can’t stop for…but he eventually arrives and the transplant’s a success, and (after 17 hours’ sleep) Wally gets to meet the patient, who conveniently has some knowledge of (at least the rumour of) Vandal Savage. After being returned home (via plane), Wally receives a package…with a heart–and meets Vandal Savage. I just double-checked…and this issue is “only” 22 pages of story. So much in it, and clear to follow, and it’s all crammed into 22 pages. 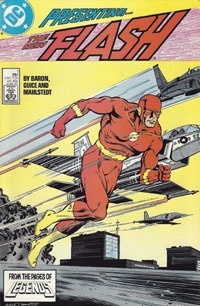 We meet the main character, and start off on this key day–he’s now The Flash (not Kid Flash), he’s just turned 20; we see him with friends/teammates for context; we get details about who he is, what he is, how he got here, limitations of his powers, etc; we see him in action AS the Flash; clear differences between THIS Flash and his predecessor are highlighted; immediate threats overcome and a new threat set up, and close on the introduction of a “big bad” for the upcoming issues. Basically, this is an excellent sort of first issue! This issue looks and feels like a mid/late-’80s book…which is quite appropriate. Guice‘s art is top-notch, and I really like it here. The detail may not quite be quite the level of, say, George Perez of this time, but it’s quite good and works very well for me, with all relevant characters looking as I’d expect for my contextual knowledge of the time, they look familiar/recognizable, and the visuals never failed me as to what was going on. Story-wise, as said, this is an excellent first issue with numerous “bullet points” touched on that I would hope and expect a first issue to do…I genuinely want to read the next issue, such that I find myself thinking I’d willingly buy the next several issues at “full back issue pricing” (up to $2-$3 per) just for the sake of immediacy on getting to read them (or $1.99 for digital; same reasoning). I really like that we get a concrete age for Wally–I’m not sure how old I’d’ve pegged him by the early 200s (probably mid-20s at least), and concrete ages don’t often seem to be established for characters. While I get that many don’t want to nail characters down or “limit” them that way, I’m one that really likes that sort of detail, even if it comparatively “ages” other characters. I also really like that Wally seems young-ish (I’m in my mid-30s myself!) and I truly get that sense of his just now stepping up into the Flash role–I can “see” the Kid Flash there, essentially “trying on” the “real Flash” costume; he wears it but does not seem particularly comfortable in it. (And I know from other stuff I’ve read ABOUT the series that that’s something that largely continues for a number of years of stories, such that the reader gets to see Wally’s progression to where he truly comes into his own as The Flash). I enjoyed this issue, and it was honestly a real treat to read. I know I snagged this copy from a quarter bin, and it’s absolutely worth 25 cents, or $1…as a #1 from when such things were treats and rarities, I’d say this would even be well worth getting up to $5ish. As you can get it digitally for about $2, I wouldn’t recommend going much above that, though, unless you’re particularly interested in owning this issue. It’s well worth the $2 to at least read, and I very much look forward to digging up the next few issues, either from my own collection or re-buying in some form for the immediacy. This is an interesting sort of issue, though the cover puts me off a bit. It’s been a generic sort of image to me, one I haven’t really–truly–looked at in years, just sort of glossing over it, recognizing it, and that’s it, because of it being what it is. 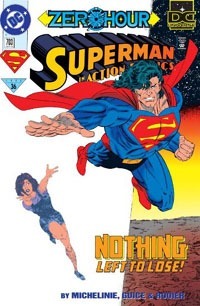 It sort of deals with the interior story, though it’s a bit misleading, suggesting Superman abandoning Lois to the Entropy thing of this story, saving himself…when the story is more his facing that sort of loss of his parents, and Lois is the last one standing. Clark returns to the Daily Planet, having done HIS part, and leaving/trusting the other heroes to do their part. But then, Perry White fades out and Superman realizes they’ve failed. 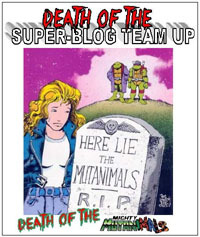 And if Time has been destroyed as recently as Perry’s birth, then his own parents–Ma and Pa Kent–won’t be far behind. So he races to them, but just as he arrives at the farm, finds himself in an alternate timeline/dimension with a younger version of his parents, and where the rocket that brought him to Earth was retrieved, while he had died as an infant. Superman and the younger Kents eventually find themselves faced with reality of Time’s destruction, and just as Superman’s about to save his own parents, he’s pulled into the Timestream for the final moments of Zero Hour, while the world–our perspective ending with Lois’ account of the approaching whiteness–is wiped out, going to the white pages ending all of the ZH books that shared this final week of July 1994. With the Superman titles all tying in, we’ve seen Superman meet numerous alternate-timeline/universe versions of Batman; we’ve seen him meet a version of his biological parents from Krypton; an alternate super-hero filling his role on another Earth; and now an alternate version of his Earth-parents. All while essentially being part of the ongoing running battle with Extant and the power behind even him. It’s both cool in the sense that we get to see Superman stories taking advantage of the time-anomalies stuff; but stretches stuff a bit to figure all this PLUS his involvement in the "main story." Still, as flimsy as explanations are between his "side stories" and the main, both seem to stand alone pretty well. I’m not overly fond of the art here, and yet it still triggers the nostalgia factor for me, and I both recognize and remember it. It fits the story and is definitely a product of its time, and I don’t know what I’d do for replacing it. It’s not bad art, just not my favorite art. Given Dan Jurgens‘ role in Zero Hour itself and obvious ties on the Super-team, the Superman titles in general fit better with Zero Hour than most; and I certainly have better, clearer memory of them as part of the event, and their being a huge part of my exposure to the DC Universe beyond the event itself, so I’m certainly a bit biased. That said, I do feel like this does more to reference the actual, developing story of Zero Hour (if not itself further developing that story) than most other tie-ins. Even so, this hardly seems essential, and will be more of interest to someone reading through the Superman books of the time than someone just reading the "core" Zero Hour series. Certainly not an issue worth paying more than $1 or so for; but not something to singularly avoid in a bargain bin, either. We’re finally nearing the end of this event as a whole, and for that, I’m definitely glad. This is one of those quasi-forgotten issues–one where I remember in broadest strokes the events but it’d been so long since reading it that it was a lot like reading a new comic. 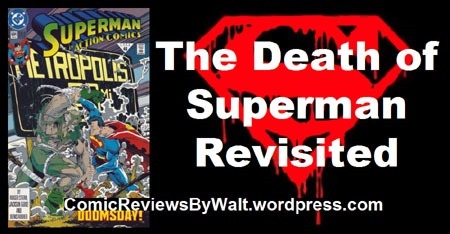 Amidst all the other time-stuff going on, Superman finds himself in an alternate timeline, with many similarities but some rather disconcerting differences. Of course, some of these are things he picks up on as he goes along–realizing, for example, that here, Lois doesn’t even know him, period–let alone know his identity or have feelings for him. 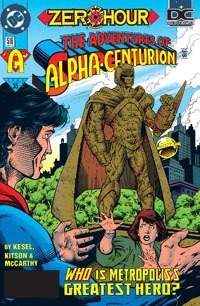 And despite the familiarity of Superman, this world’s hero is the Alpha Centurian–a character we’ve apparently seen before but this was the first meeting between him and Superman personally. By issue’s end the situation is revealed and the two are allies, off to dive back into the whole saving-all-of-time-and-space thing. I think when I saw Alpha Centurian in a previous issue of Zero Hour itself, I assumed he’d already been introduced…my mind just didn’t parse out the details or question anything. And yet, I knew this was where the character comes into the Superman stuff–"that issue with his name on the cover over top of Superman’s." I suppose not having looked ahead to the covers, conscious memory failed me and all that. Anyway, this is another solid issue that plays firmly into the stuff that Zero Hour is about–that is, Time is mucked up and allows for a bunch of anomalies and parallels and alternates and the like. In this case, we get a new Superman ally…one that (as I recall) becomes a recurring member of the supporting cast for a time–much as a one-season character can be close and important for a single season of a tv show. At this point, 20+ years after the fact, this issue having a "guest penciller" means little to me, particularly for this specific title. The art’s just the art–neither phenomenal nor bad. It works for the issue, gets everything across, and I’m perfectly fine with that. 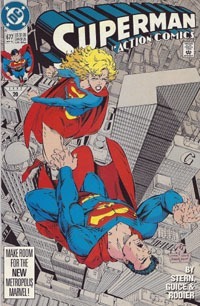 The story itself is cool, revisiting this "moment" in the history of the Superman story and seeing (again) the first meeting (officially) between the two characters and being thus able to cast my mind back to that summer and the following year or so as this Alpha Centurian was a recurring cast member NOT from Reign of the Supermen, yet I was there "from the beginning." Superman is front-and-center in Zero Hour itself, so his having time for not just one "side story" but multiples is a bit of a stretch in general…but then, he’d had four ongoing series at this point, all of them tying into Zero Hour (given especially the ongoing/weekly nature of the four Super-books). This was a pleasant read, if not terribly contributative to the ongoing Zero Hour saga. Other than being a sort of first-appearance/first-meeting, it’s not singularly stand-out in a way that screams "go out and read this to thank me later" or anything. Still, if you find it in a bargain bin, it’s worthwhile. Picking up from the last chapter, Superman and the Guardian (and a fallen Maxima) are in the ruins of the town that’s just been the latest casualty of Doomsday’s rampage. While news reports flood the airwaves, Supergirl itches to go into battle to help Superman, but is talked down by Lex, urging her to stay in Metropolis in case she’s needed–after all, Superman can’t be in any real danger, right? 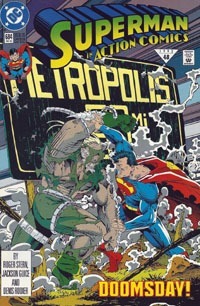 With Lois and Jimmy in one ‘copter and Cat Grant of WGBS in another following the story, Superman hurls Doomsday away from his Metropolis-bound path and into “the Habitat,” an organic city created by the Cadmus project, bringing Cadmus into the fray…though even that doesn’t seem enough to help. The art style here is a bit different than previous chapters of this story, in a way that is both noticeable and yet hard to describe. 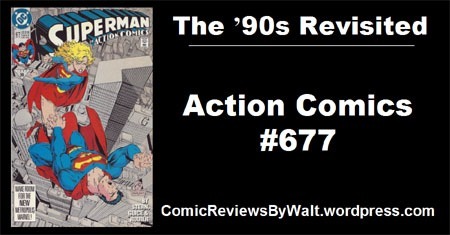 No complaints with it, though…it fits the story, conveys the action, and we can see that Superman is getting worn down. The story isn’t all that deep–we get a few moments of character interactions to show what’s going on WHILE Superman is battling Doomsday (and to explain, for example, why Supergirl holds back). Overall, this continues the long fight scene that makes up much of the story. This does not seem out of place in tone from other chapters, and other than the variation in visuals keeps a great consistenc with earlier chapters. Something that jumped out at me on this read-through is Lex-Mart, the store destroyed in this issue. I immediately thought of Wal-Mart, but the in-store dialogue reminded me this was probably based on K-Mart…illustrating what a difference 16 yers can make in the real world. Somehow, this issue often feels like the low part of a totem pole, lost in comparison to the other issues, as this neither begins nor ends the story and even lacks the distinction of a penultimate chapter. Remains a strong chapter none the less, holding well its place within the story, and holding up well through the years.